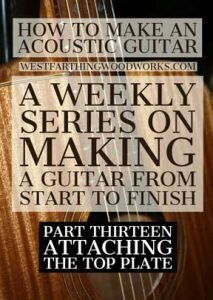 This is How to Make an Acoustic Guitar – Part 13 – Attaching the Top Plate. 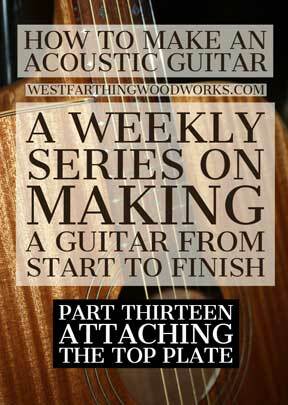 In this part of the series, I’ll show you how to attach your finished top plate to the sides, closing up the body. 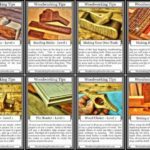 Also, there will be several tips and tricks along the way to make the process easier. Enjoy. 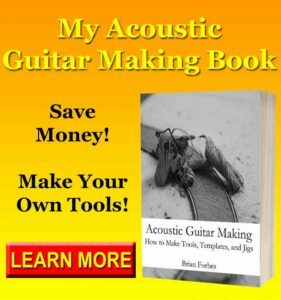 Attaching the top played on your acoustic guitar is one of the most fun activities in the entire process of making an acoustic guitar. This is the plate that seals in the body, and makes it one solid structure. 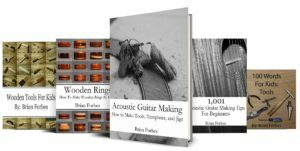 At this point, you have a handmade acoustic guitar body in your possession, and it should really get exciting all of a sudden. Up until now most of the things you’ve been handling have been random parts and pieces. Now that your body is complete, rather, at least put together, the parts and pieces that you have been handling thus far finally start to look like something. It’s a cool feeling, and I’ll show you exactly how to get it coming up. The first thing that you need to do before you attach your top plate is to inspect it really well and look for any issues to address. It’s much better to work on the plate while it is separated from the sides than to find something later when it is attached. The big thing that you’re looking for are separated braces, cracks, areas that just need to be sanded or cleaned up a little bit better, and the dome shape. Make sure that your top looks the same way you intended when you made it. If you do find anything that needs a little bit of help, make those adjustments now. 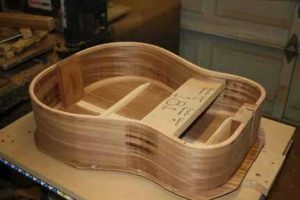 One thing to remember is that this will be one of the most difficult areas to reach once the guitar body is fully sealed. If it needs a little sanding, now is definitely the time. 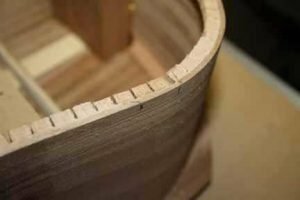 In order to start the fitting process, you must first align your soundboard on the sides to be perfectly straight with the center line. The center line is an imaginary line drawn through the head and tail blocks of the sides creating symmetry on the left and right. The best way to do this is to line up the center seam joint on your top with that imaginary line at the head and tail block of the sides. Clamp down both ends to keep the piece from moving, and now you’re ready to start marking. At this point, mark all of the braces with pencil where they cross the sides. Mark them at the outside edge of the sides, and do this all the way around the entire plate. Make your marks carefully and accurately, which will be important later. Also, make a couple marks on the side itself for the outside edges of the brace that crosses in that area. This will be important later on as well, so again make sure this is accurate. Remove the top, and elongate the marks on the sides across the kerfing to match the path that the brace will take as it passes through the area. If the brace comes in at an angle, duplicate that angle with your lines. On the top, measure back the thickness of your sides, and make another mark next to all of the marks you already have. These will be closer to the middle of the plate. Cut off the ends of the braces at that point, and re-scallop the ends to be 1/8 inch tall for the last half inch of length. 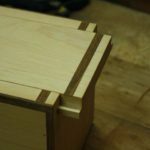 Now that you have all of your marks in place on the kerfing and on the sides, use a chisel or a Dremel to create pockets in the kerfing that are 1/8 inch deep, and match the angle of the braces that are coming through. The 1/8 inch tall ends of the braces that you just carved to shape on your top will slide into these pockets, so make sure that they are just big enough to fit. The point of the notches is so that the kerfing helps hold the brace ends down. Go all the way around the guitar body making your pockets, and checking their fit. Once you’ve done the entire body, you can proceed to the next step. This is one of the most important steps that you are going to do in this entire process, and it will set you up for success when you get out your glue. The test fit will help you diagnose any major problems before they become glue covered problems. 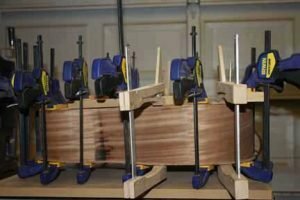 Set your top on the sides exactly how you would if you were gluing it together. Now, check how well the top seals against the sides. Look for gaps, and adjust your pockets in your kerfing or the thickness of your braces to get them flush together. 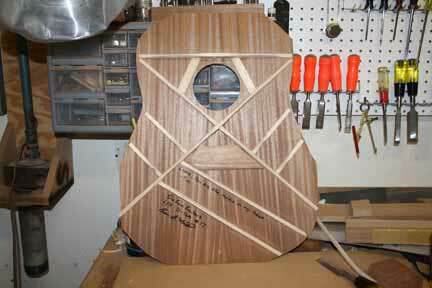 Apply several clamps all the way around the rim of the guitar just as if you were gluing it. Take a look all the way around, and once you have a good seal without a lot of fuss, you are ready for glue. This part of the operation is where it gets serious. 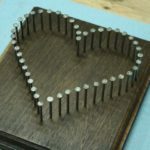 You’re going to glue the two pieces together, and though you have several minutes of open time with most good wood glues, you do need to work quickly to be successful. That being said, set yourself up for success right from the beginning. 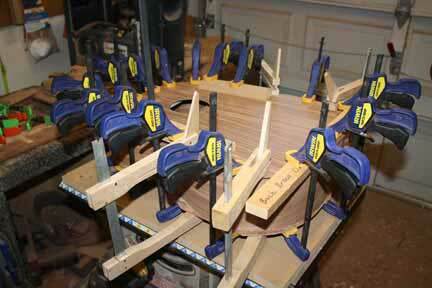 Have all of your clamps that you used in the test run ready to go, and even grab a few more just for insurance. 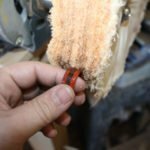 Have your glue ready, and even have a little brush or roller to make application faster. 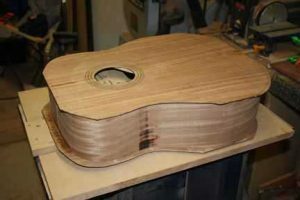 Apply a layer of glue to the edge of the sides and the kerfing where it will contact the top plate on the acoustic guitar. Don’t hose the thing, but don’t be stingy either. Once you have a nice layer that is evenly spread, lay your top in place. Work quickly to align it with the center line, and then start clamping it down. Clamp the head and a tail first to maintain your alignment, and then start clamping near where the braces make contact with the kerfing. From there, add more clams in between. Add as many as you need to seal up the rim, and then check all the way around to make sure that you have a good seal. Of all the things that you do when you make your guitar, there really isn’t any one super gigantic thing that will make a guitar much better than the next one. There are a lot of things that you can screw up and make the guitar awful, but we’re not talking about failure here. One thing that is worth paying attention to is how well you seal the body. Air leaks in the body interfere with the way a guitar operates. There should only be one big air leak, and that’s the sound hole. If you followed the instructions well up to this point, you shouldn’t have any issues. However, if there are any really large gaps between the sides and the top plate, you definitely want to address them before moving on. If it’s something so drastic that it can’t be covered with a binding strip, then it’s best to cut the top off and start again. 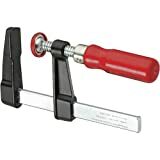 However, that type of mistake is extremely rare, and your binding strips will help seal up any tiny cracks. Well, now we have an acoustic guitar body that has the plates attached to the sides. From this point we need to trim the plates flush to the sides. After that, it’s time to do a little routing and create the rabbits for the binding strips. 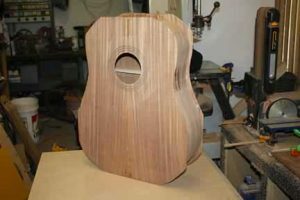 This is one part of guitar making where you get to show off a little bit of woodworking ability, and add some of your own touches. Binding strips are just thin pieces of wood that are used to wrap the guitar and give it some character. 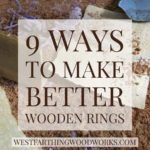 You can use a lot of different types of material, but in most cases a contrasting color of wood is used to highlight the binding strips. Since you’ve already bent some sides, bending the binding strips will be a little bit easier. If you have any questions about attaching the top plate, please leave a comment and I’ll be glad to answer them. Happy building.